Regardless of who's standing on the podium's top spot next month, Tessa Virtue Scott and Moir have set the ice dance bar sky high, not only in Canada, but globally. Contrary to popular belief, Canada's ice dance darlings Tessa Virtue and Scott Moir were once sweethearts. Virtue was seven and Moir was nine. Former long-time coach Paul MacIntosh affectionately recounted how they would tell people they were dating, all the while being so shy they barely spoke, or even glanced in one another's direction. "The whole world would like them to date. But they were 'dating' at age nine and seven, and I think Scotty broke it off. And he would say that's 19 or 20 years of regret," MacIntosh laughed. Theirs is an undeniable chemistry two decades in the making. Skating to Gustav Mahler's dreamy Symphony No. 5 at the 2010 Vancouver Olympics, they not only became the youngest ice dancers to win gold, they tugged on Canadians' heartstrings and reeled them in with their illusory on-ice romance. Their storybook performance in Vancouver was so believable, viewers could never have guessed that Virtue was skating through pain so excruciating from compartment syndrome in her lower legs that she could barely walk from her apartment at the athletes village to the cafeteria. Now 28 and 30, they're no longer the fresh-faced, self-proclaimed "kids" who captured the imagination in Vancouver, but boast a partnership that's only grown stronger with time. They hope to close their illustrious career with gold at the Olympics later this month in Pyeongchang, South Korea. Virtue and Moir were paired up in 1997 by Moir's aunt and coach Carol — Carol and Moir's mom Alma are identical twins. In the early days, the ice dancers split time training with Moir and MacIntosh in London and Waterloo, Ont. Virtue chose ice dance over ballet, after she was invited to attend the National Ballet in Toronto at a young age. They eventually moved to Waterloo, where they boarded and attended high school. "Pretty early in their career they showed an awful lot of musical promise," said MacIntosh, who coaches at the Kitchener Waterloo Skating Club. "They were a small couple, they competed against kids much older than them, and much bigger ... but they showed musical talent, and edge and gliding talent that was well beyond their years, at a very early age. Probably at a time they were maybe nine and 11, we knew they had little magic feet, and magic music, and they seemed pretty comfortable with expressing that music." 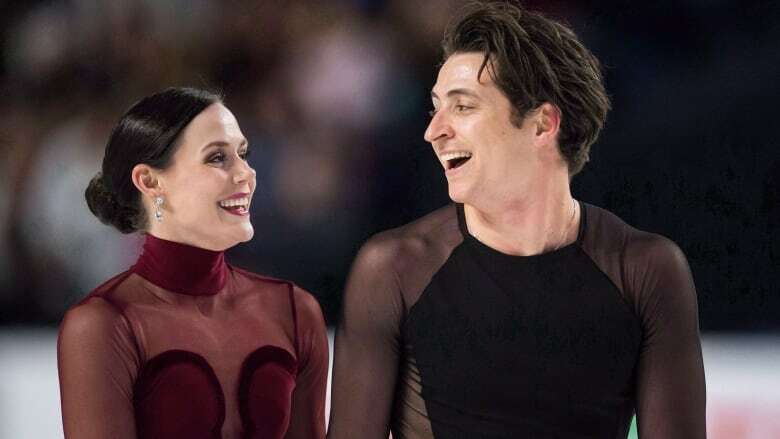 Virtue and Moir, who will carry Canada's flag into the opening ceremonies on Feb. 9, went on to win three world titles and eight national titles, and then stepped away from the competitive arena after their disappointing Olympic silver in 2014 in Sochi. They returned last season, and intent on reclaiming their Olympic crown, they upended everything about their training environment. They left Canton, Mich., and long-time coach Marina Zoueva and headed for Montreal, where they've assembled a mighty team around them. They're coached by five-time Canadian ice-dance champions Marie-France Dubreuil and Patrice Lauzon, but also work regularly with sports psychologist J.F. Menard, nutritionists, and sports physiologists, among others. They've even trained with Cirque de Soleil. Virtue and Moir were undefeated in their comeback, a perfect run that included a world championship win in Helsinki last spring, until they lost to French rivals Gabriella Papadakis and Guillaume Cizeron at the Grand Prix Final in December by less than three points. The Canadians' rivalry with the young French team — Papadakis is 22, Cizeron 23 — is reminiscent of their matchup four years ago against Meryl Davis and Charlie White. Like the Americans who edged them for gold in Sochi, Papakis and Cizeron share the same coaches as Virtue and Moir, at the same Montreal rink. "We were pretty open that we don't plan on coming second at the Olympics like we did at Grand Prix Final," Moir said earlier this month. "So we kind of went back to the drawing board." They couldn't have asked for a better launch pad into Pyeongchang. "They continue to show such a diversity in how they've approached all of their programs over the years, that's one of their greatest strengths is their versatility and ability to skate to different types of music," MacIntosh said. "[Their free dance] is very complex, they have one main rival in the world who are amazing skaters themselves [in Papdakis and Cizeron] who are kind of like the masters of simplicity, and I think Tessa and Scott are the masters of complexity. "So it makes it hard for people to judge the two teams, because they do have different strengths, but Tessa and Scott, they just deliver so much passion with their performance. The short dance is a Latin rhythm … any rhythm really is good for them, but they both trained in Latin rhythm very well, Tessa moves like no other woman in the world and Scott like no other man." Regardless of who's standing on the podium's top spot next month, Virtue and Moir have set the ice dance bar sky high, not only in Canada, but globally. Canada's other two ice dance teams of Kaitlyn Weaver and Andrew Poje and Piper Gilles and Paul Poirier could also finish within striking distance of the podium. "Our three leading teams are three of the absolute masters in the world, so they've set some pretty primo examples for our young kids in Canada," MacIntosh said.